Stuart Dallas is hoping to make it a season to remember by helping Brentford reach the Barclays Premier League. The Bees are preparing for Friday night’s Championship play-off semi-final, first leg clash with Middlesbrough at the Griffin Park. 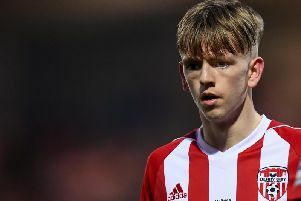 Dallas is just three games away from reaching the promised land of the Premier League – and realising a dream that dates back to his days as a flying winger with Coagh United and Crusaders. Dallas joined Brentford from the Crues in the summer of 2012, just after helping the Shore Road men clinch a historic all-Ireland Setanta Sports Cup. The 24-year-old admits the first result he looks out for on a Saturday night is that of the Seaview club. And after watching Crusaders lift the Irish Premiership crown this season, Dallas is hoping to continue the celebrations with Brentford. “Crusaders winning the league and Brentford winning the play-offs – that would be some year,” said the Northern Ireland winger. “I am delighted for Crusaders. They are the first result I check for every weekend, and I keep in touch with a lot of the lads at the club. “It is a great club, and I was delighted to see them finally win the league. They have always been knocking on the door, and this time they got over the line. “The Setanta was my final game and a great way to leave the club. I also won the League Cup with the Crues but lost the Irish Cup final. Another catalyst behind Dallas’ success in the Championship has been Brentford manager Mark Warburton. Warburton has guided the Bees to the cusp of the Premier League for the first time in the club’s history. The last time they graced England’s top flight was back in the 1946/47 season. “Warbs has done fantastic. He has been a big help to me,” Dallas said. “I was out on loan at Northampton for a while, but I came back and the manager put his faith in me. Bizarrely, Warburton will part company with Brentford at the end of the season – even if he guides them to the Premier League. Warburton is to leave Brentford after the Championship play-offs following a reported disagreement with the owner Matthew Benham regarding the club’s long-term strategy. It means Friday’s home game against Middlesbrough will be his last at Griffin Park, having guided the club to a fifth-placed finish in the Championship after leading them to promotion from League One last season. “It is a strange position for the manager to be in, but as players we just have to focus on football,” Dallas added. “We are employees of the club and just have to do our best for Brentford. “Mark is well respected throughout the club, from the players to the fans and officials. “Hopefully we can gain promotion and send him off on a high. It would be a great way for Mark to bow out, and he deserves every success.